We are excited to announce the release of ROCm enabled TensorFlow v1.8 for AMD GPUs. This post demonstrates the steps to install and use TensorFlow on AMD GPUs. Now that TensorFlow is installed, let’s run a few workloads. Finally, let’s do some multi-GPU training with ResNet-50. We’ll be using TensorBoard to monitor the progress, so our workflow is split into two terminals and a browser. For this example, we’re assuming that you have your ImageNet dataset under “/data/imagenet”. 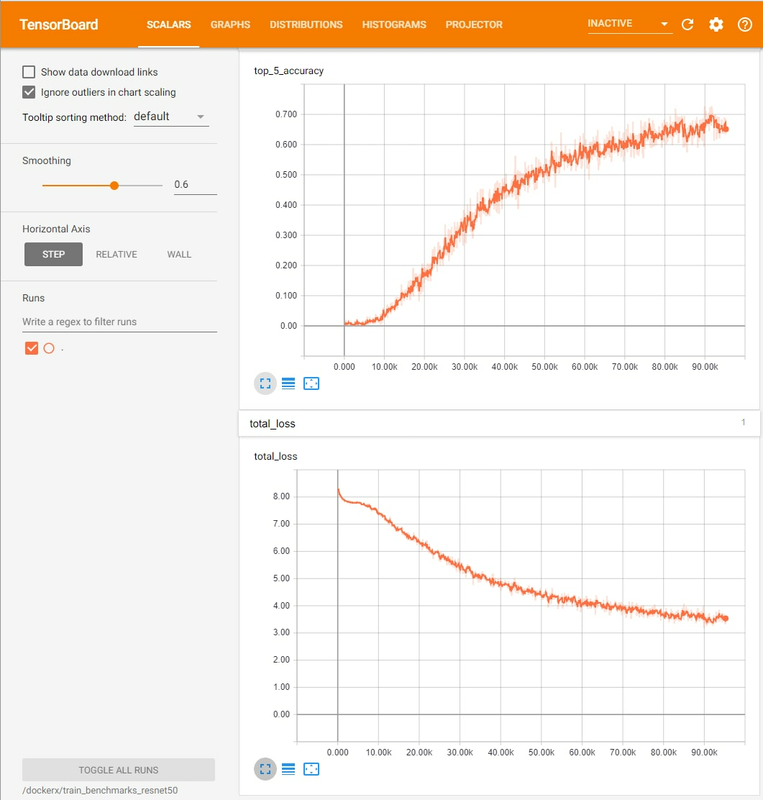 With TensorBoard, you can visualize the loss trending downward and the accuracy heading upward. Jeff Poznanovic is a Member of Technical Staff at AMD. Links to third party sites and references to third party trademarks are provided for convenience and illustrative purposes only. Unless explicitly stated, AMD is not responsible for the contents of such links, and no third party endorsement of AMD or any of its products is implied. Why is tensorflow built without SSE? Hi Derek, sorry for the late response. We try to keep a balance between portability and performance, so that might be why we had not built with SSE4.x. Hi Jeff, could you include Python 3.7 in your automated builds? Alas, the installation fails on freshly installed 16.04. It is very difficult to install on anything else as it uses python 3.5 (current versions are using 3.7). It looked so promising… you would think someone actually tried it before publishing. sigh. CPU here is a AMD Ryzen 7 1800X. I also tried compiling this stuff but this didn’t work out either. I have rocm installed and the hello world example is running. Can you please try with our most recent whl? We’re at TF 1.12 now, and it includes many improvements. tensorflow-1.8.0-cp35-cp35m-manylinux1_x86_64.whl is not a supported wheel on this platform. Hi Sam, sorry for the late response to your comment. We’ve made improvements to our Python packages in the last few months. Are you able to do these steps below with Python 3.5? I have done all then got this “tensorflow-1.8.0-cp35-cp35m-manylinux1_x86_64.whl is not a supported wheel on this platform”. Can you help me? I’m using ryzen5 2500u with vega8. Hi Rana, sorry for the late response to your comment. Were you using Python 3.5 w/ pip3 to install that whl file? Can you try the following? I’m a consulting meteorologist and Software Developer who has a new idea/approach that I want to try that is NOT based on modeling the atmosphere. But will rely on a good training set and unique approach for weather prediction. I have ALWAYS been an AMD fan and loved every CPU/APU/GPU I’ve bought over the years. But I’m truly disappointed in the lack of response from anyone on fixing the issues these folks have getting tensorflow up and running using Rocm. My deadline to make a decision on new GPU’s for my ML dev box is January. I LOVE the AMD Vega architecture with 64 Compute Units, 256 Texture Units, and 4096 Stream Processors. I still have faith. I intend to wait until the last possible minute. Then if I don’t see real progress, for the FIRST TIME in my adult life I will have to buy an NVIDIA 2080ti. I still hate the idea of using a closed source, closed hardware language like CUDA. Please help us guys! Hi John, thanks for your comment — my fault for not seeing these blog comments, trying to address them now. We typically are very responsive on our GitHub project — that’s the best way for issues to be seen by multiple folks on our dev team. Is there any support for macOS? I’ve successfully installed Rocm-m for Python. How can I use it in Tensorflow-node? Is it possible to run it on tensorflow-node? Hi, I want to know is it possible to use ROCM on Tensorflow-node. It has it’s own tensorflow-node-gpu module, but it supports only CUDA. I ‘ve successfully installed ROCm support for Python, but I need it in node.js. Do you have support for tensorflow-node.js ? does the Radeon™ RX Vega M GL graphics support? Is it possible to use a 13 AMD GPU mining rig with your release? I’d have to install a fresh OS, which would be Linux. Is there any help to follow? I am running a Tensorflow program for DeepLearning using ROCM. I installed the tensorflow-rocm library. I have 5 GPUs of type Radeon RX Vega 64. Unfortunately only one GPU is employed when I run this program. Do you have an idea how to solve this?